Flash drive has becomes one of the must have personal companions in your daily life. Besides scaling up to much higher capacity, some of the flash drive manufacturers do try to have more innovative idea in order to excel in this competitive market space. Similarly, Sandisk Corporation has just unveiled a next generation single button simple backup flash drive in CES 2009 event held in Las Vegas currently. Named as Ultra Backup USB portable flash drive, it is claimed to be the world’s first USB flash drive that features with simple one touch auto backup and AES hardware encryption capability. The Ultra Backup USB product simplifies the whole backup procedures by just a single touch on the built-in button. 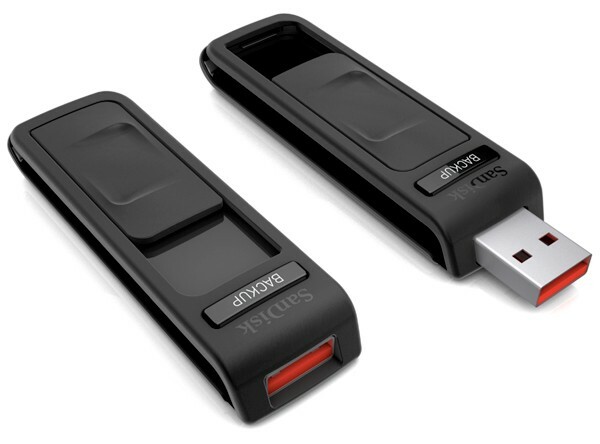 On top of its easy back up functionality, the next generation Sandisk Ultra Backup USB product is further enhanced with double security protection to ensure that no intruder is able to steal your confidential data without knowing your password as well as ability to decrypt AES hardware encrypted data without your permission. This is definitely an ideal solution for those travelers that doesn’t want to carry a bulky hard drive for backup purpose but still want to ensure all their important data are safeguard with just a tiny portable flash drive and more importantly, the easy backup mechanism does help to eliminate the hassle of performing manual backup unnecessarily. The new product will be available in commercial market by April 2009 with capacities ranging from 8GB to 64GB at a retailed price of $39.99 and $199.99 respectively.